The MacBook's graphics chipset used a portion of main memory as VRAM. Though reported as a 64 MB graphics system, the chipset actually used a minimum of 80 MB of RAM, resulting in a maximum of 432 MB of RAM available for system use in the base system. Announced in May 2006, The MacBook replaced the existing 12- and 14-inch iBooks and 12-inch MacBook Pro: a dual core Intel Core Duo processor, a faster 667 MHz bus speed, a faster and larger Serial-ATA hard drive, an integrated iSight camera, a MagSafe power adaptor, and a bundled remote control with Apple's Front Row Software. It also included some features previously found only on Apple's professional laptops: optical audio in/out, a DVI port capable of monitor-spanning, and Gigabit Ethernet. Two features unique to the MacBook were a magnetic latching system with no moving parts, and a resigned recessed keyboard. One potential drawback to the new MacBook was that its graphic chipset used a portion of main memory, resulting in less RAM available for system tasks. This was offset, however, by the MacBook's two RAM slots, which allowed the installation of up to 2 GB of memory. The MacBook shipped in three configurations. The low-end model, with a 1.83 GHz Core Duo processor, 512 MB of RAM, a 60 GB hard drive, and a CD-RW/DVD-ROM Combo Drive, sold for $1,099. The middle-end model, with a 2.0 GHz Core Duo processor, 512 MB of RAM, a 60 GB hard drive, and a CD-RW/DVD±RW SuperDrive, sold for $1,299. Finally, a high-end model shipped in a black case (the first black Apple portable in more than five years). 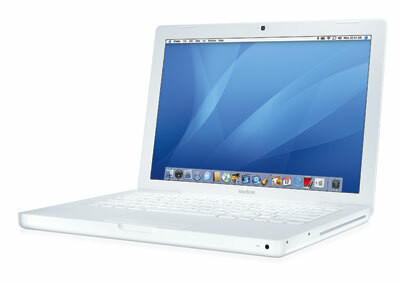 It improved upon the middle-end model with an 80 GB hard drive, and sold for $1,499. 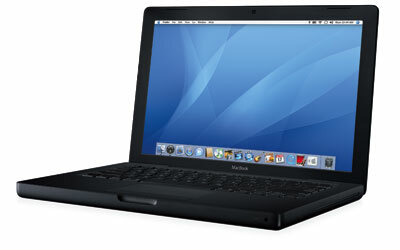 All models were replaced in November 2006 by the Mac Book (Late 2006).